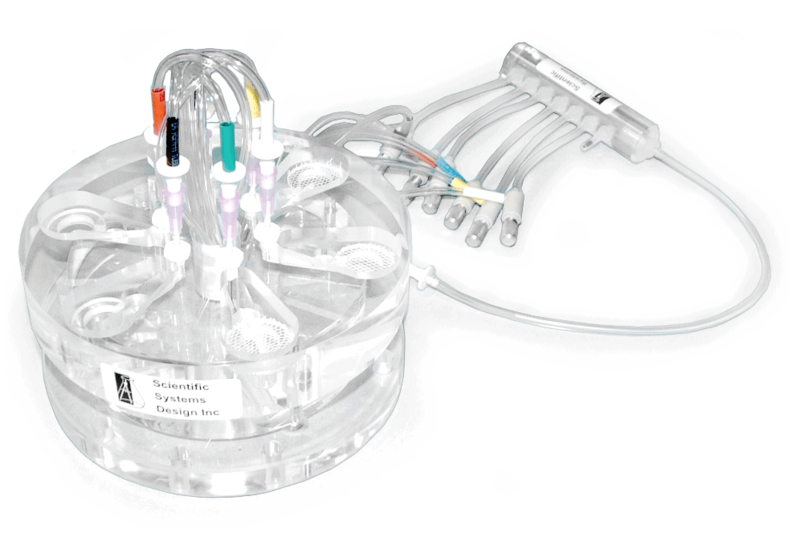 The BSK6-6 Brain Slice Keeper has been designed to pre-incubate six separate sets of brain slices in solution volumes of 4ml prior to transfer into recording chambers. This enables slices to be pre-loaded with experimental test solutions that are too expensive for large volume dilutions. It consists of a large acrylic disc into which is machined six completely independent wells. Each well has a closely fitting acrylic ring between which is wedged a removable sheet of nylon netting. The design of each well is such that when bubbled by an attached needle, a stream of oxygen bubbles introduced from the side are made to circulate the solution from the top downwards on to the net whilst also saturating the solution with oxygen. A channel below the net re-circulates the solution and exerts a downward force on the slices holding them down on the net. In operation, each of the BSK6-6 wells is filled with ACSF until the ‘C’ ring insert is totally immersed at least 1mm above the rim. Each well is supplied with a separate feed of 95% O2, 5% CO2 mixture via a needle submerged at one end of the well. The feed of the gas mixture to each well is from six fine flow gas regulators, supplied with the slice keeper. These in turn are supplied from a 1-into-6 gas input manifold also supplied with the chamber. Before introducing slices the wells are over-supplied with oxygen to saturate the incubating media. After a few minutes the oxygen flow rate is reduced and the BSK6-6 is ready to accept one or two slices per well which are placed on the net. After several uses the nylon net can be replaced by pulling the acrylic ‘C’ ring and wedging a new sheet in between. Schematic arrangement of BSK6-6 with detail of a single well including a cross-section view. 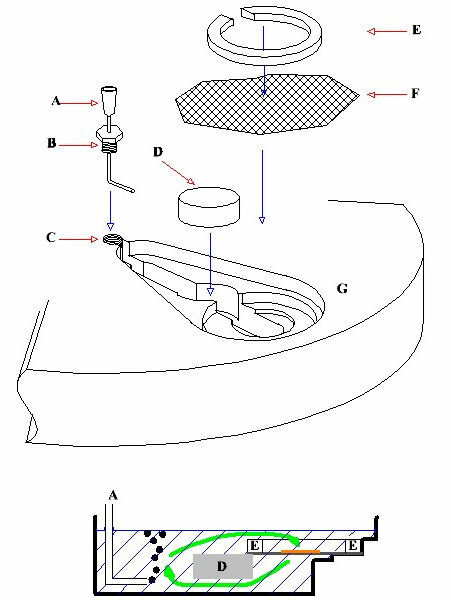 A blunted 18G hypodermic needle [A] is inserted into a plastic fitting [B] and screwed into the chamber at [C]. The blunted tip is bent at 90˚ and used to bubble the gas mixture which creates a flow of solution towards the slice located on the nylon netting, which is in turn held by a tightly fitting ‘C’ ring [E]. The flow path continues under an acrylic plug [D] returning back to the bubbling region to complete the cycle (green arrows in lower drawing) The acrylic plug is normally held in place by the ‘C’ ring but can be lifted out when cleaning the slice keeper. The nylon netting [F] is placed over the well [G] and the ‘C’ ring [E] pushed down over it and the excess is removed by cutting with a new scalpel blade or small scissors.